THEM Anime Reviews 4.0 - Baccano! Distributor: Currently unlicensed, formerly licensed by FUNimation. Also Recommended: The upcoming Durarara!! is based on a novel by the original creator of Baccano!, and retains most of the staff, so it might be worth checking out. Notes: Based on the light novel series by Ryohgo Narita, serialized through Dengeki Bunko. In 1711, a group of alchemist huddle aboard the ship Advenna Avis, seeking to conjure a demon who will grant them eternal life. In 1930, a young sister is looking for her brother in Depression Era New York City, unaware that he has fallen into bigger trouble than she could imagine. In 1931, the transcontinental train The Flying Pussyfoot departs for her final trip, where something so horrific happens, and where so many of her passengers died, the event was immediately covered up by the authorities. The beginning of Baccano! is a disorienting experience. Forget linear storytelling-the series actually spends half an episode debating just how to tell its story through a sequence of meta dialogue between a newspaper vice-president and his secretary. What it settles on is scrambling a tale that already has a huge scope in terms of ground covered and characters included by jumping around between several seemingly unrelated storylines, and doesn't settle down until several episodes after that. And even then, even then, I still wouldn't blame you if you felt lost. Some people have said that it's disrespectful of the audience to do this-it's like throwing them out in the ocean without a life vest. But that's an odd criticism, since it implies that it's respectful to simply tell a story like anybody else would, using the same techniques we learned in 6th grade English class. Isn't that just milquetoast? And it's especially odd when you level that criticism in anime, where anything resembling "normal" is routinely routed, twisted and bungled for the sake of being as cool as possible. Like The Melancholy of Haruhi Suzumiya, Baccano! deliberately abandons those conventional methods with reckless abandon. And unlike Haruhi, there's a meta-textual method to its madness; a commentary on how stories never really have a proper beginning or ending, that what we watch and read is only a snapshot of something much bigger and that continues long after the final reel goes black. And when you're telling a story as big as this one, are there even main characters, or just one person of many who the narrator arbitrarily picks? It's an appropriate theme for a story about immortality, and especially this one. Most media portray immortality the same way: a route "be careful what you wish for" fable. Surprisingly, Baccano! eschews that idea and embraces immortality, because life is an excellent, excellent thing. As long as you have friends and family to live it with, who are you kidding? Why wouldn't you want to live forever? Especially when it's friends like the cast of characters populating this anime-a suite of eighteen that includes Jokers, Thieves, Murderers, Gangsters, Lovers, Monsters, and even a couple of Idiots make up the "main cast." There's Miria and Isaac, a lovable duo of happy-go-lucky thieves who have only gotten away with so many crimes because they pull them off in profoundly stupid ways. There's Dallas, a young punk who is a much worse thief, if only because he accidentally stole the wrong thing at the wrong time. There's Szilard, a sinister immortal who has been scamming people for over a century with a fake immortality elixir. He has just recently recreated the real deal, though, and is enraged that some punk has stolen it. His silent assistant, the emotionless homunculus Ennis, is supposed to retrieve it. And she meant to, but she met this sweet boy named Firo, who is the ingenious new inductee to the Camorra mafia family. Ladd Russo is a psychotic son-of-a-gun who has boarded the Flying Pussyfoot with his gang of white suit assassins to kidnap a Senator's family. He didn't count on the black suited orchestra actually being a rival group of assassins, or on the Rail Tracer, a monster that hunts down trains and devours its passengers. And then there's the Gandor and Martillo family, Dallas' sister Eve, the cult leader Huey Leforet, his mute daughter Chane, the capable crybaby Jacuzzi and the sadistic kid Czeslaw. 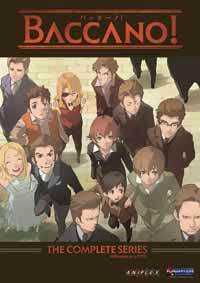 In a hobby filled with colorful and memorable characters, Baccano! 's cast leave a helluva an impression, and when it seems like the story is beyond your grasp, latching onto the strong cast makes the road to understanding less bumpy. Even when you sit down and string the events of this series into a linear path it's still a crazy tale. Much like a Rube Goldberg contraption, seemingly unrelated subplots bump into other subplots, which coincidently stumble onto other events before characters meet other characters in strange circumstances, creating a surprise twist. I should note here that "baccano" is Italian for "ruckus," and it's an apt description of this series. In Highlander: The Search for Vengence, having immortal characters who healed from nearly any wound gave its director Kawajiri a license to show outlandish violence. Baccano! doesn't so much take that idea a step further as give it a running start. Heads will roll, and if there wasn't anything you would recognize as a head left, it will still piece itself back together...on camera. Like Kurozuka, it's a stylishly violent series with so much blood being spilt it almost repaints the dining car in the Flying Pussyfoot red. I haven't seen anything like it since Hellsing Ultimate- it's so outlandish it could only have been visualized through animation. It's not for the squeamish, but for people like myself who enjoy stylized violence like this, it's a treat. It helps that the animation looks great throughout, especially for a TV series- the initial episodes looked so good I was afraid that the finale's budget would only allow for a series of still frames. You'd expect a series mostly set in the Great Depression with so much violence and danger to be...depressing, but in the end, it's a joy to watch. It's a suspenseful series with such a large cast that it feels like no one is armed with plot armor-no one, even the "immortals," are guaranteed to come out of this insanity alive. There is a palpable feeling of danger. And when it wraps up, even with a few threads left dangling, some justice has been served, and even better, some characters find love. While the series ends on an epilogue that feels a bit flat, it left me with the best possible feeling: a mixture of contentment and a hunger to see more. Recommended Audience: Lots of blood. Like mentioned in the review, when immortality calls, the need to restrain oneself lessens. Of course, said immortality also probably takes some of the brunt off said violence as well. Version(s) Viewed: R1 DVD, streaming media. Baccano! © 2007 Brains Base, Mediaworks, Project Baccano!